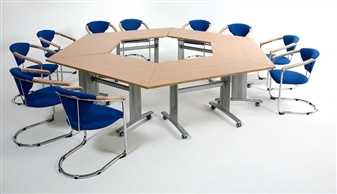 Elite range of flip-top tables in rectangular, trapezoidal, and semi-circular shapes, with a sturdy, heavy-duty frame and leg construction and on lockable castors. The tables will nest together for easy and convenient storage. 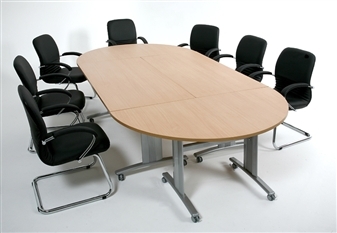 These tables are suitable in a school or college office, in the meeting room, training rooms, the canteen, for banqueting, conferences, function rooms, hotels, and many other settings. 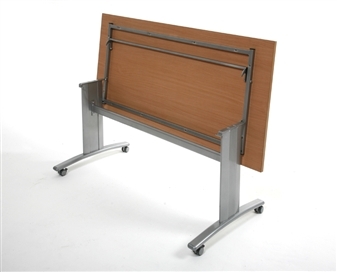 The folding tables have wipe-clean solid laminate 25mm tops which come in beech, oak, ash, walnut & wenge. The aluminium frames come in an attractive silver powdercoated finish or black finish. 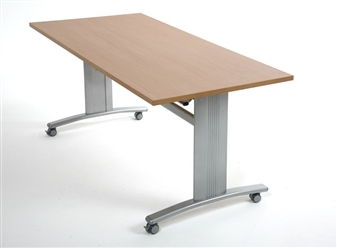 The tables come fitted with locking castors for easy mobility. Ideal For Schools, Colleges, Hotels, Conferences, Etc..